Happy Friday friends! It’s a bittersweet weekend over here as we prepare to send James back to school on Monday! He’ll be going into third grade and that suddenly seems so old! At this age, he’s a fascinating mix of maturity and innocence, with a good bit of sweetness still there. Since he was a baby, I’ve loved every age and 8 is no different. We’re still waiting for his backpack to arrive and I ordered him these khaki pants and khaki shorts for his school uniform. I’ve found they’re good quality and a lot less expensive than at the regular uniform shop. Now we need to get him a haircut, grocery shop for school lunches and try to get back on the sleeping routine STAT. I taught James in kindergarten how to get ready for school without me nagging, so we’ll see if we’re still good on that this week! Although we’ll be sad to not have James home everyday with us, I know I’ll be happy to get back to our routine. 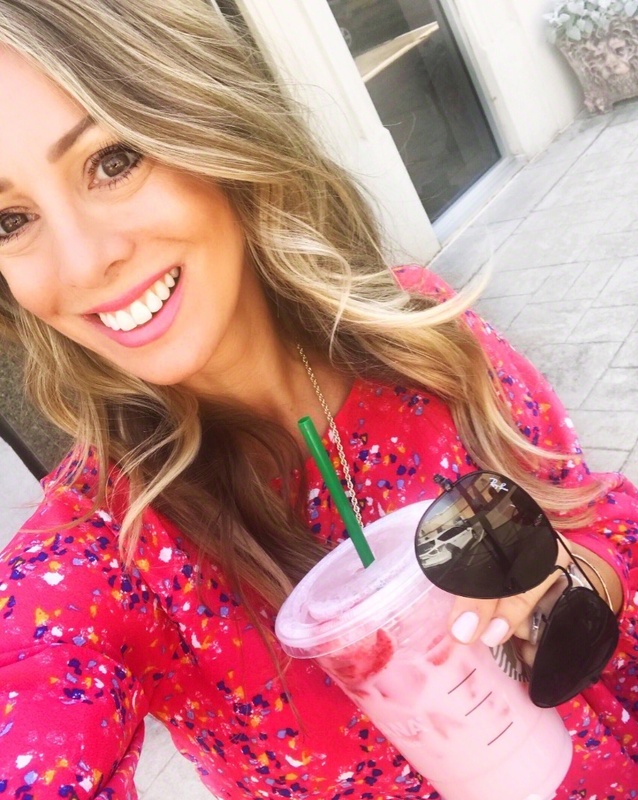 I’ve struggled with “balancing” summer with work and life and exercise and all.the.things. I work from home, so I often felt like I should be doing more with my kids. Even as I type that sentence, I feel the mom guilt wash over me. It’s so hard, right? I don’t feel like I really excelled at any of it- but I knew from past summers that’s how summer tends to go. So, I tried to lower my expectations and do the best I could. If I’m honest with myself, the kids are FINE. In fact, they’re awesome. It’s me I need to work on. I have a lot of help and I’m so thankful for that. 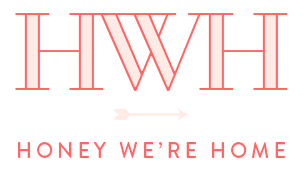 I’d never be able to get done half the things that happen at home and on my blog without it. I’m not too proud to admit that I can’t do it alone! I’m really good about giving others grace, but then I have to remind myself to extend those same sentiments to myself. 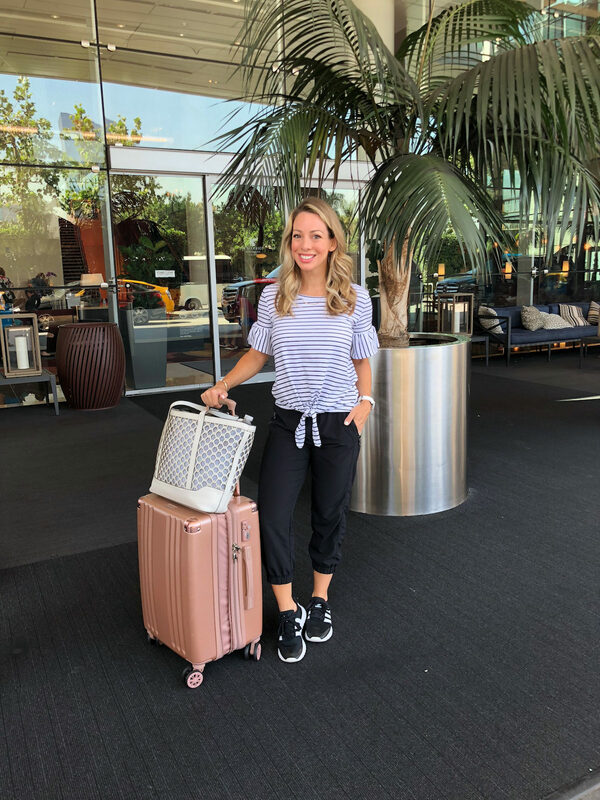 Today I’m rounding up what I’ve been doing and wearing lately as summer winds down and the kids head back to school. It’s been awhile since I’ve done one of these posts, so be forewarned- it’s a long one! 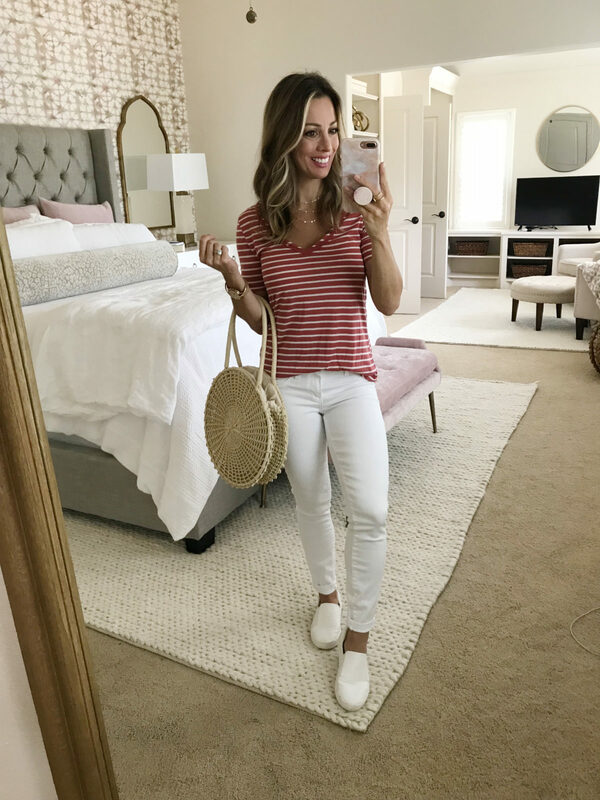 My white jeans are still going strong and they’re on sale for a steal right now- under $27! They go with everything and I especially like them with this palm print cami that’s 33% off now. In fact, most of the entire Gibson x HiSugarplum collection is 33% off and there are lots of pieces left in varying sizes! I love how happy this collection is with cheerful colors and prints, including this halter and this romper. But you also can’t go wrong with casual joggers in grey! We are so excited to be launching a holiday glam collection with Gibson in time for all of your holiday festivities this year! 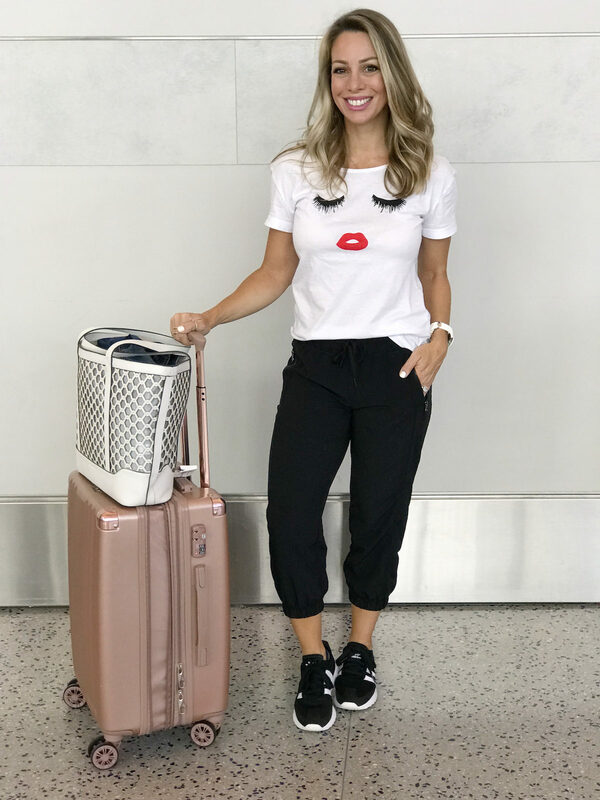 For the trip to LA to preview the collection, I kept it comfy and cute in my favorite crop joggers and eyelash tee! Lots of compliments on that top and it’s only $13! 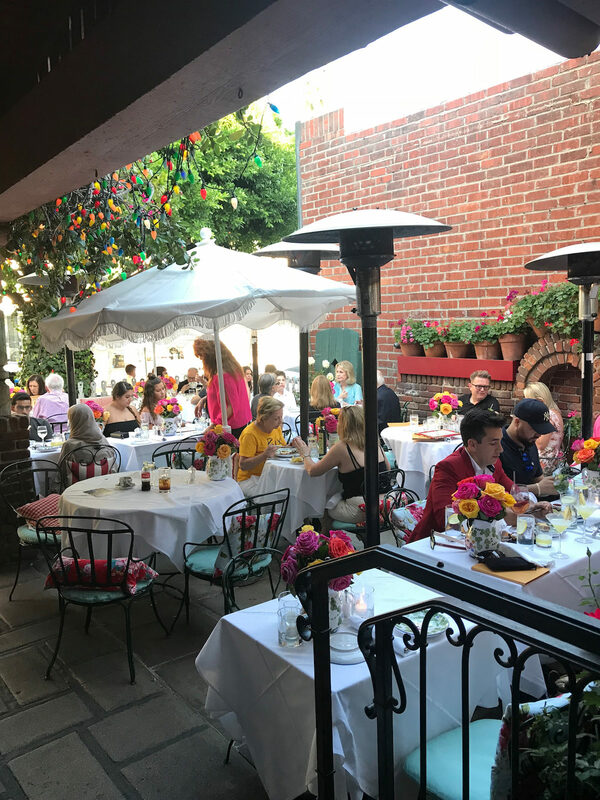 First stop in LA was dinner at The Ivy. It was wonderful to get to hang with Mallory and Ashley in person for a change and to get to enjoy a meal outside without sweating our butts off! While we were there we met with Mrs. Gibson herself, who is actually named Suzie and a super cool and all-around fabulous woman I am thrilled and honored to be working with. She founded three clothing lines: Gibson, Harlowe & Graham and Olivia Moon. That evening at dinner, I wore my sassy red jumpsuit. 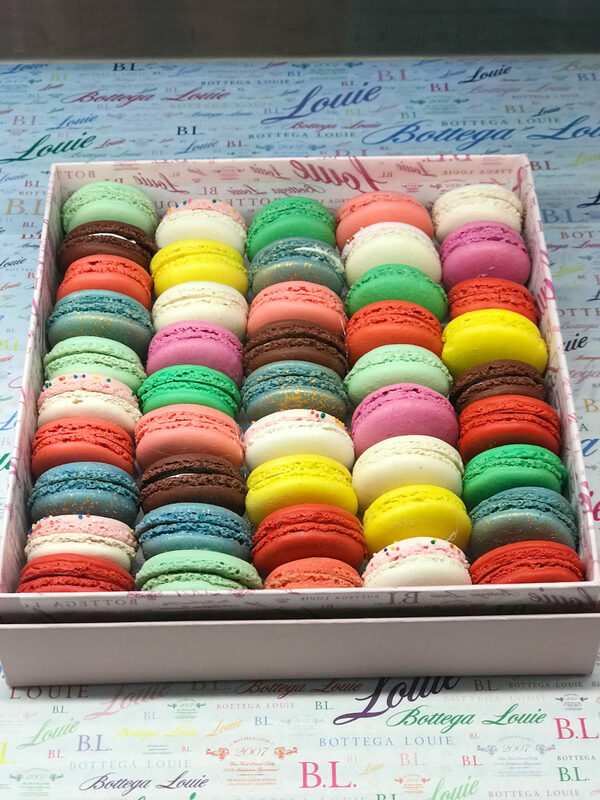 Bottega Louie is the cutest place and a gorgeous array of colorful Macarons greets you as you enter. I got a lot of questions about these cute polka dot pajamas on Stories. They are darling and from Amazon! Speaking of, my first ever Amazon fashion haul will be live on Monday! Crop joggers and a cute striped top for the ride home too. As you can see, I’m already loving my Amazon finds! That top is only $15! 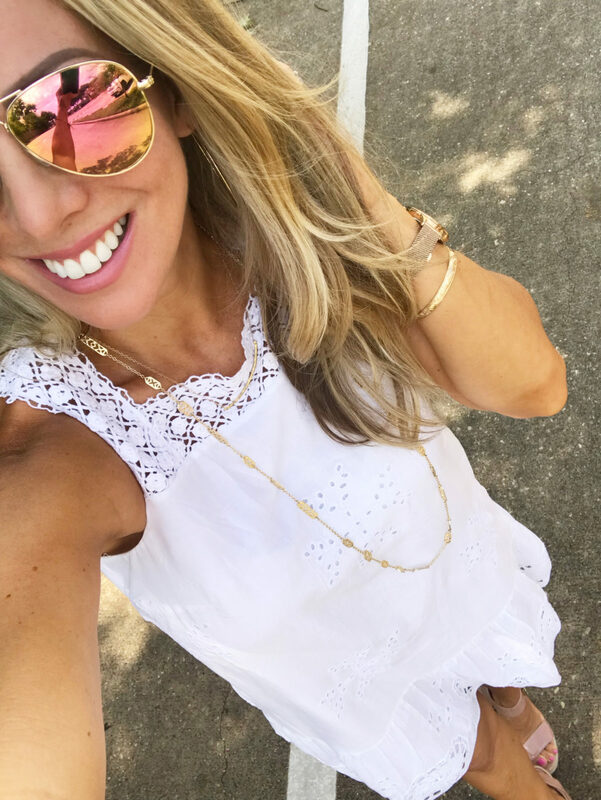 I’ve been mixing it up with jeans, shorts and dresses for running around, heading to dinner, or just enjoying this last month of summer with the kids. 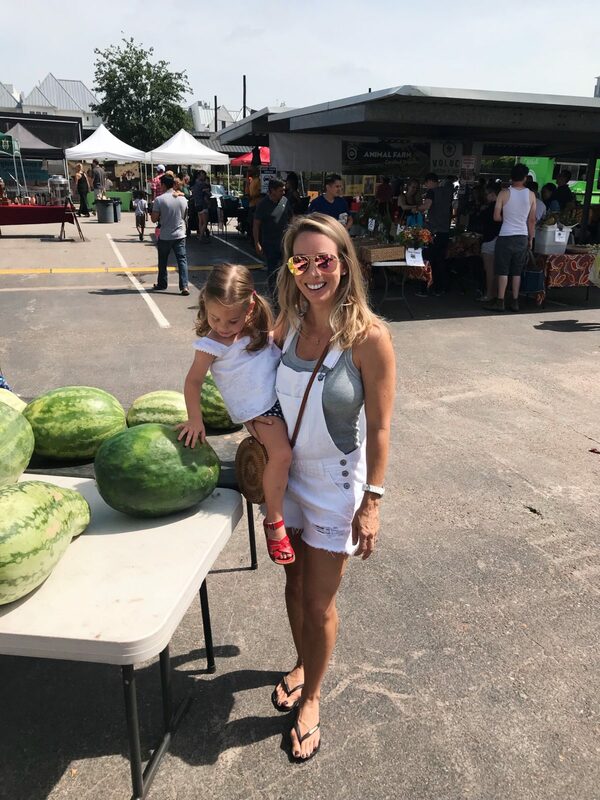 The Farmer’s Market was one of the new things we did last month and I’d love to go back when it’s not blazing hot and we can browse around more. 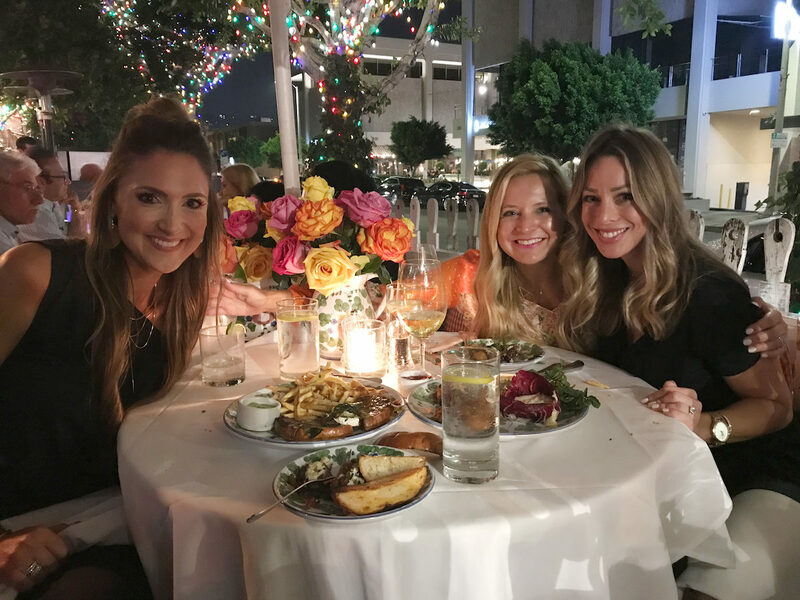 I try to make a point to get together with my girlfriends because I love our time together so much. Sometimes we make a date two months out to get on everyone’s calendar. Or sometimes, an impromptu date it is! 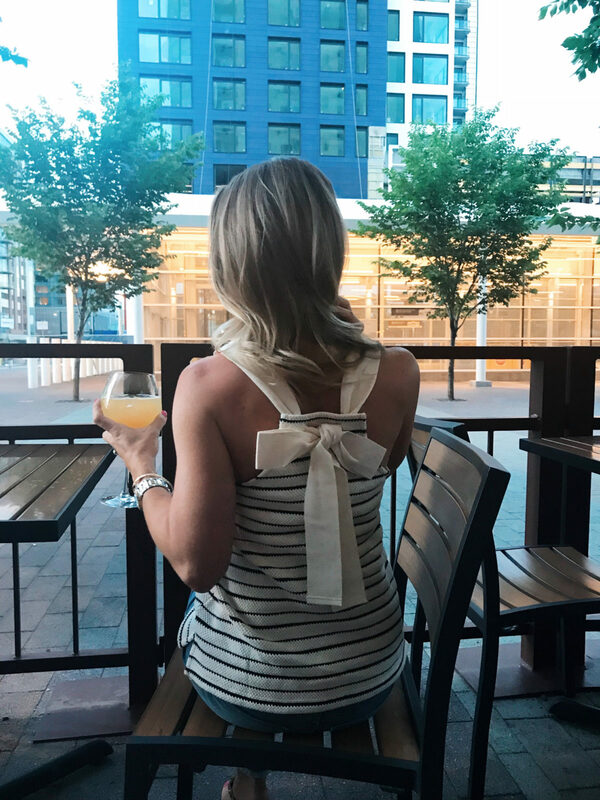 I love how sassy the back of this dress is with the little tie and ruffle. 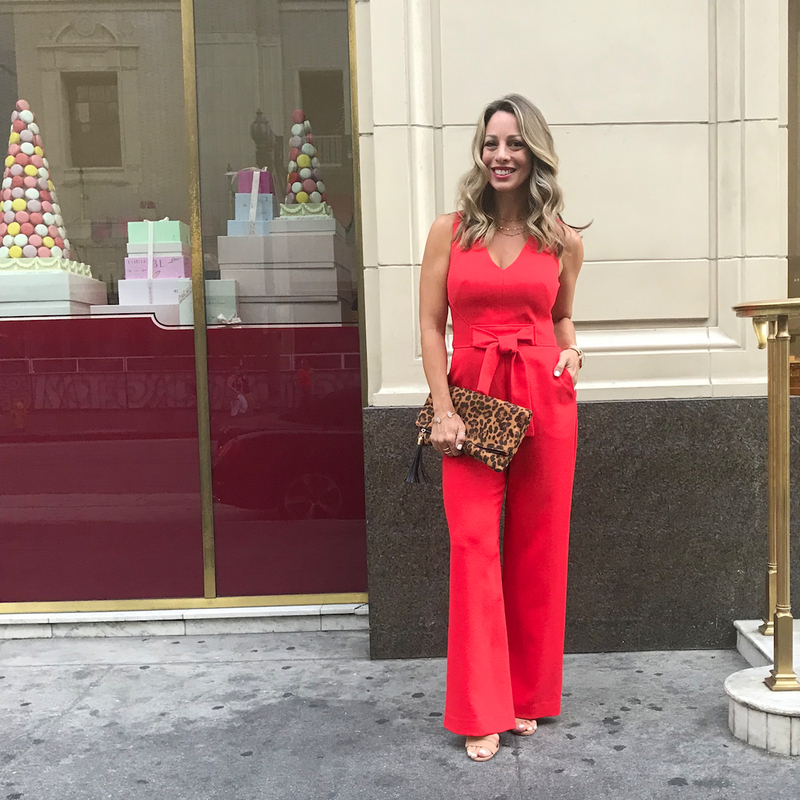 I don’t wear a lot of red, but when I do I love when it’s got extra sass (see jumpsuit below). Plus, it has pockets! This top has the cutest peplum shape and tiny floral pattern with tie sleeves. You’ve seen these scallop shorts before, I love them so much I bought them in the black also. They’re easy to dress up or down. 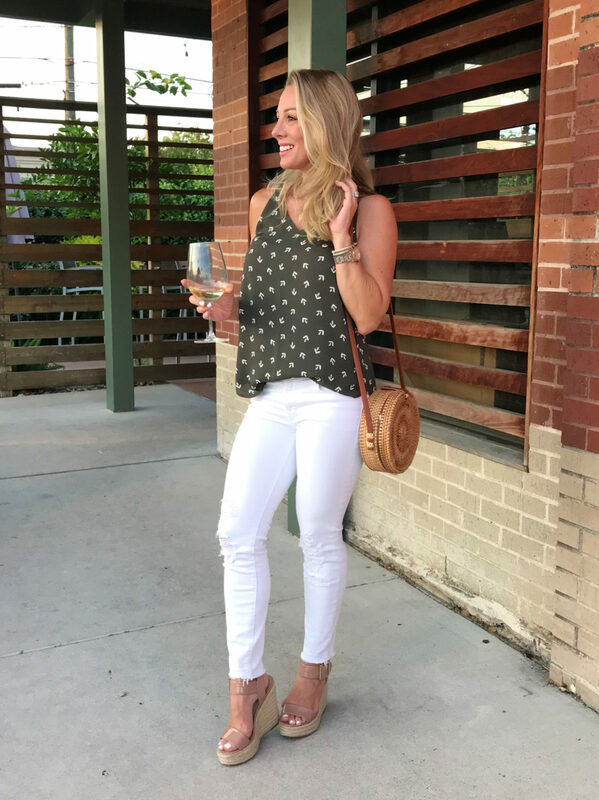 This cute summer cami with a bar back and loose fit came to family date night. We went and had dinner with the kiddos and treated them to McDonalds shakes afterward. This is the kind of look is easy for looking put together in public but still being a comfortable, casual look. This peplum tee is a super soft, lightweight sweater material, and it comes in a rainbow of colors- Size down though. These boot cut jeans are my favorite for legs for days. They have a lot of stretch so I sized down in them too. 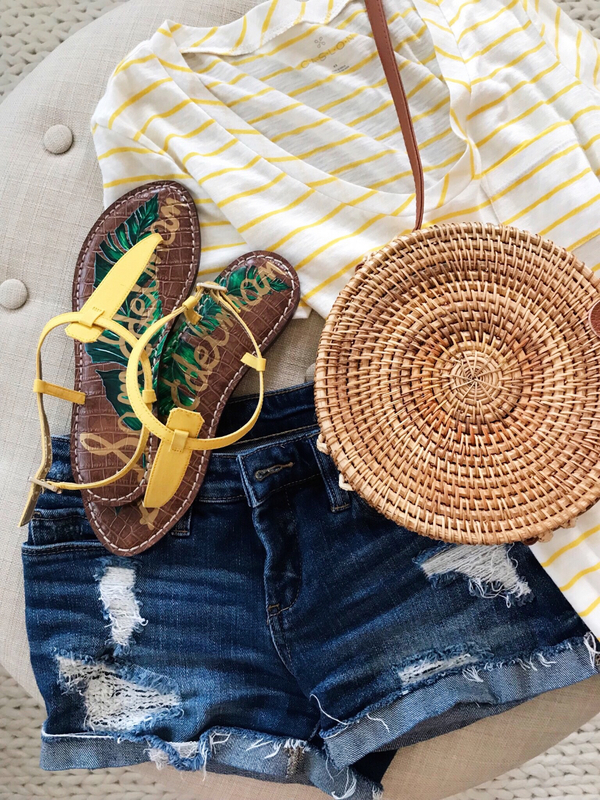 This t-shirt and jeans outfit is complete with cute slide sandals for running all the errands. The tee has a flowy, fun neckline and is just regular cotton the rest of the way down. It really adds that little something extra to your basic t-shirt. I was lucky to get to celebrate my BFF’s 50th birthday in Denver. We had such a good time and those trips are rare occasions for us so we soak up every minute. She doesn’t live close to me anymore, so any chance to see her for an extended time is special. 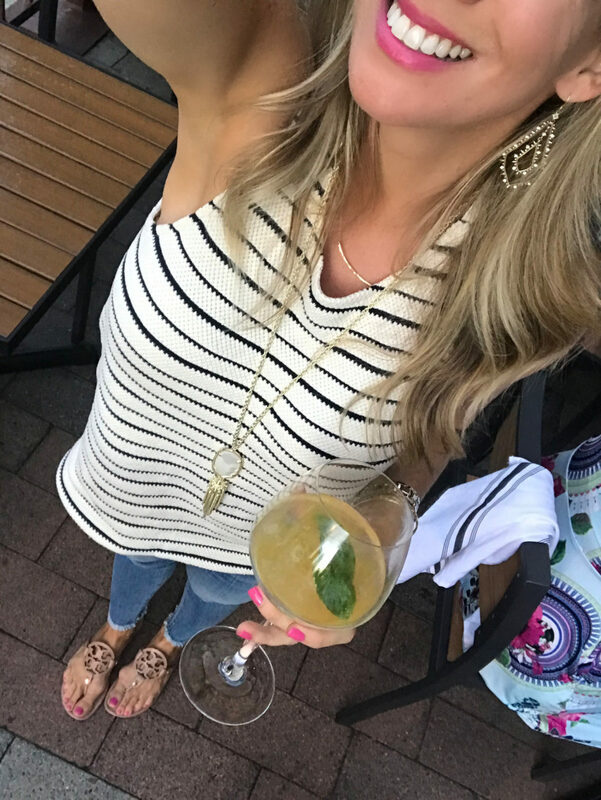 This top is co cute – a sweater tank with stripes. #spiritanimal And when you turn around, it has the most darling bow-tie back! More casual jeans and jean shorts for everyday life. And I was crazy for this colors in this dress. So pretty for summer and so easy to wear with the forgiving shape. 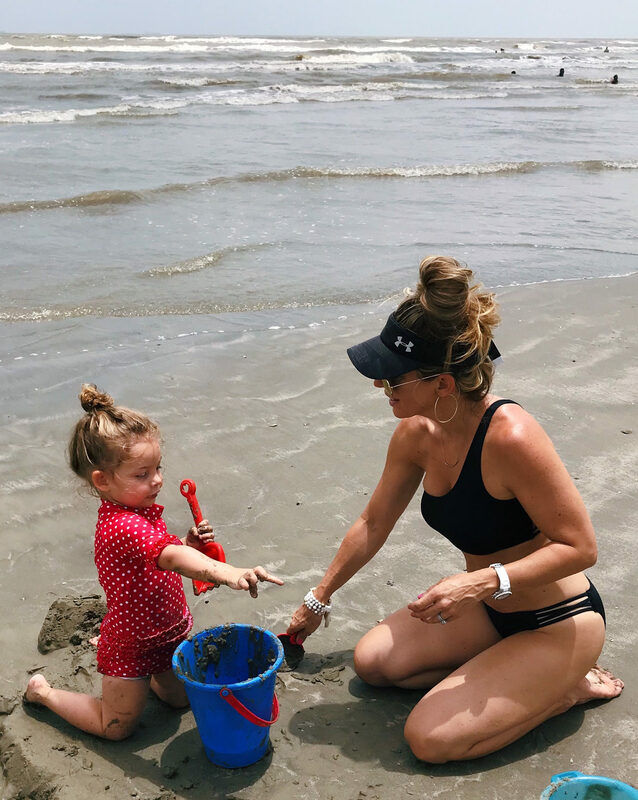 The day trip to Galveston was one of the highlights of our summer too. James had a blast on his boogie board in the ocean and Jordan is all about digging in the sand. I swear she could dig for hours! And I spent more than my fair share of time at the Houston Galleria last month during the Anniversary Sale. We even ate dinner there one night- gotta love the Cheesecake Factory. Chocolate Chip Cookie Dough cheesecake is my fave! A FULL day of shopping requires comfort. 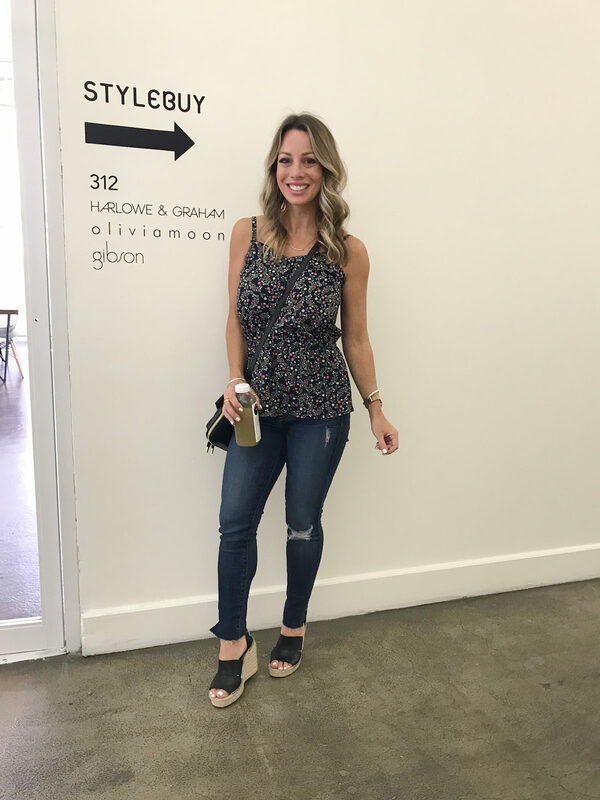 This v-neck tee is easy on and off between dressing rooms and these skinny mini jeans are my all-time fave. The everyday wedge sandal looks cute, but is also easy on your feet when doing a lot of walking! These were my three favorite jumpsuits from the sale! But I did have to alter the length in all three. If you’re #teamjumpsuit this is one you’ll want to get your hands on! It looks great on everyone I’ve seen it on! I love the vibrant red, but it also comes in black and cobalt blue. It’s made of comfortable, stretchy crepe material with pockets and a faux tie belt. 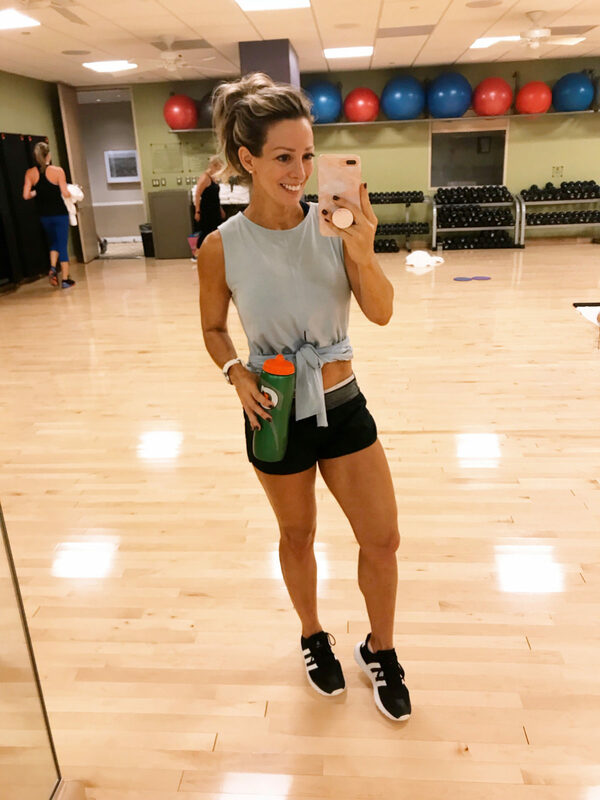 I fell off the workout wagon in July with only a couple workouts here and there, but I’m back at it and gearing up for the next HWH Fitness Challenge that will start in September. 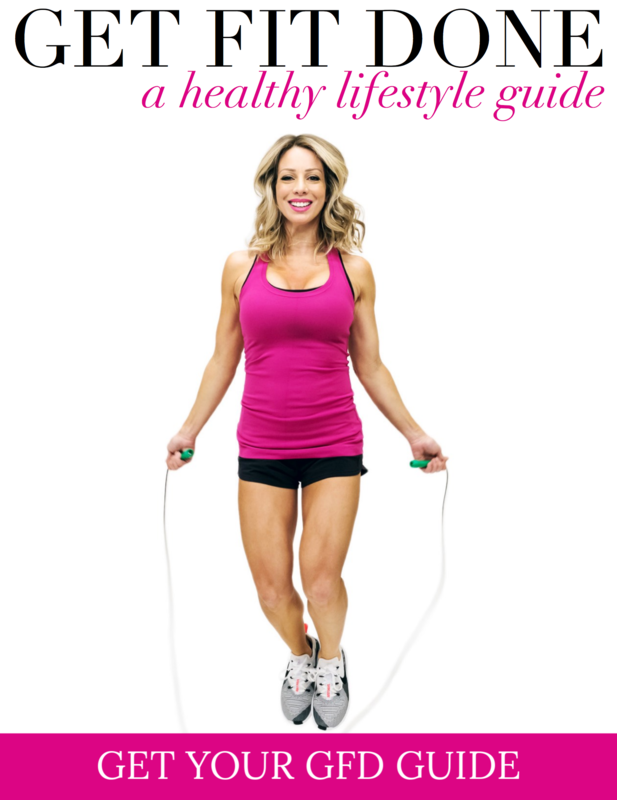 But, be sure to sign up for my newsletter, because the first meal plan will go out on Saturday, September 1st to subscribers! It wouldn’t be summer without trips to the pool! It’s the only way to stay cool in the 100 degree heat and humidity in Houston! I can’t leave you without my favorite thing to wear- pajamas! 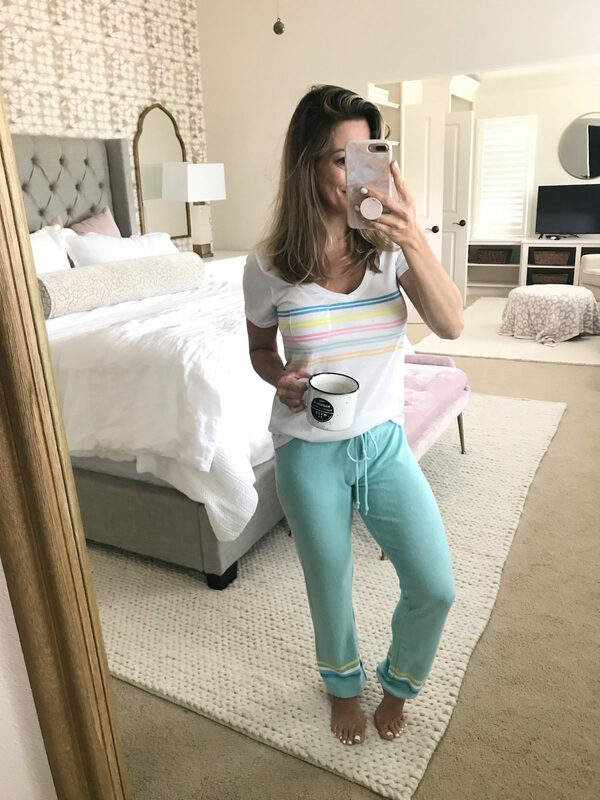 I love slipping into a cozy pair of pajamas at the end of the day and then staying in them as long as I can on the weekends! 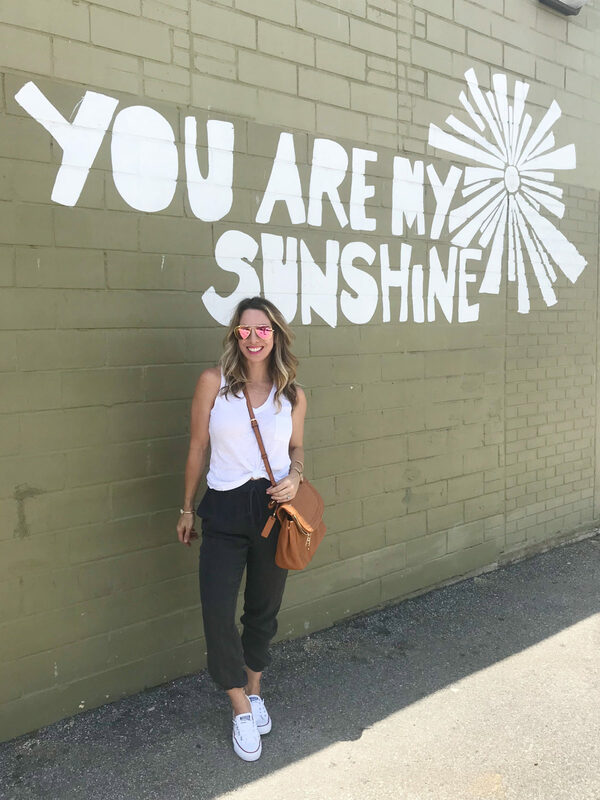 My picks: I obsessed over these High Waist Crop Skinny Jeans last year and a love a good twist hem tank, especially under $15. NORDSTROM RACK • Everything is always on sale! 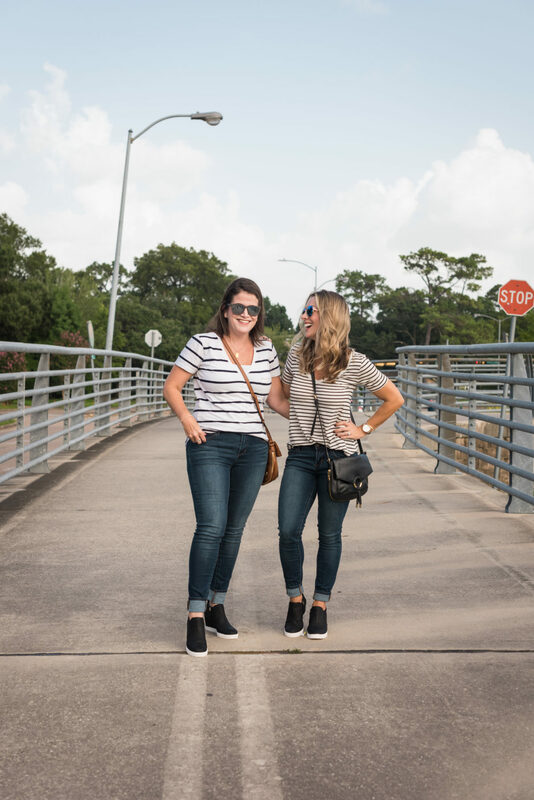 My picks: If you love boyfriend jeans, you’ll love these dark wash casual jeans! 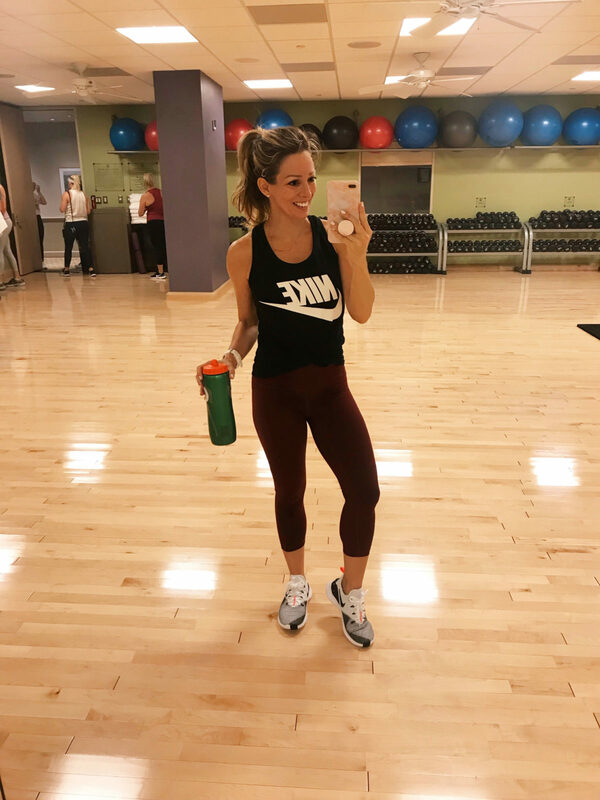 And you can’t go wrong with some of my fave workout leggings! My picks: Sleeveless sweaters are a great transition to fall piece. This criss cross ruffle flare dress would be perfect for a special occasion! My picks: This cozy sweatshirt will be nice for fall and this wrap front sweater has serious Work.Weekend.Wow potential! 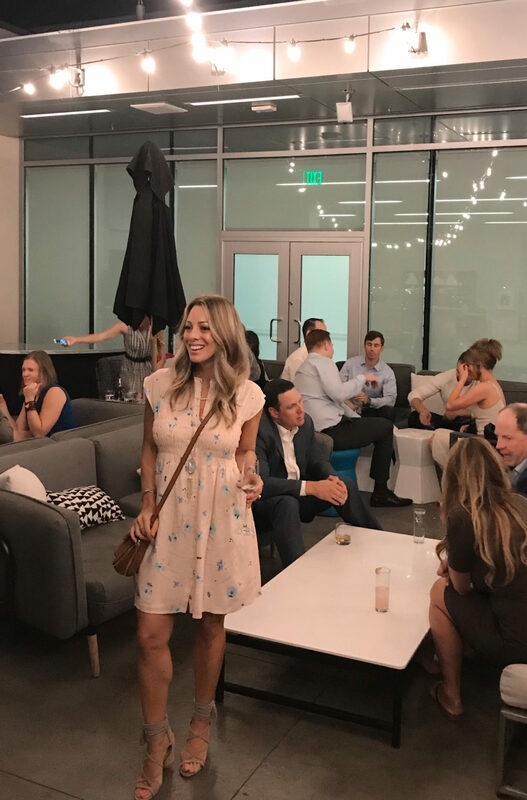 My picks: Fall weddings and work events were made for dresses like this, this and this! I can you tell I’m having a floral moment? BLOOMINGDALES • Earn a gift card up to $750 based on how much you spend! 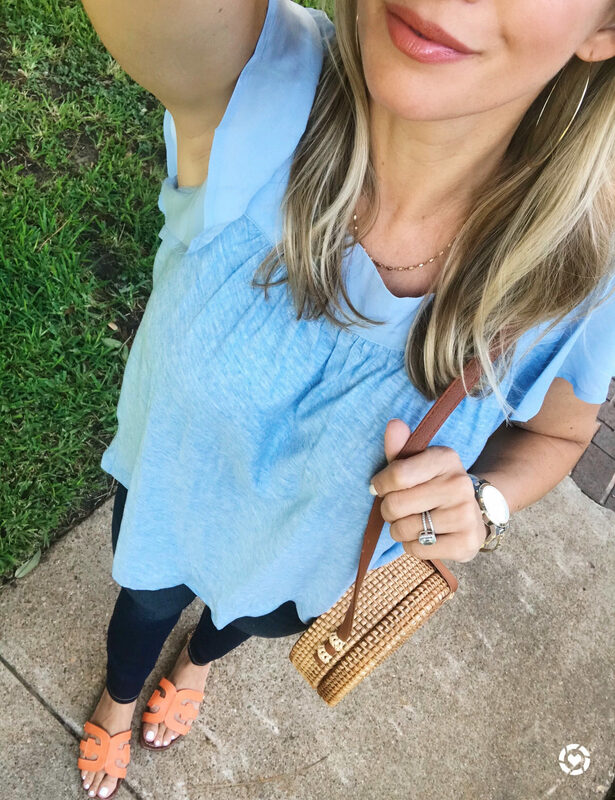 My picks: Lots of good cold shoulder options – this chiffon blouse is so pretty and $35. This floral print has pretty flare cuff sleeves too and it’s $32! 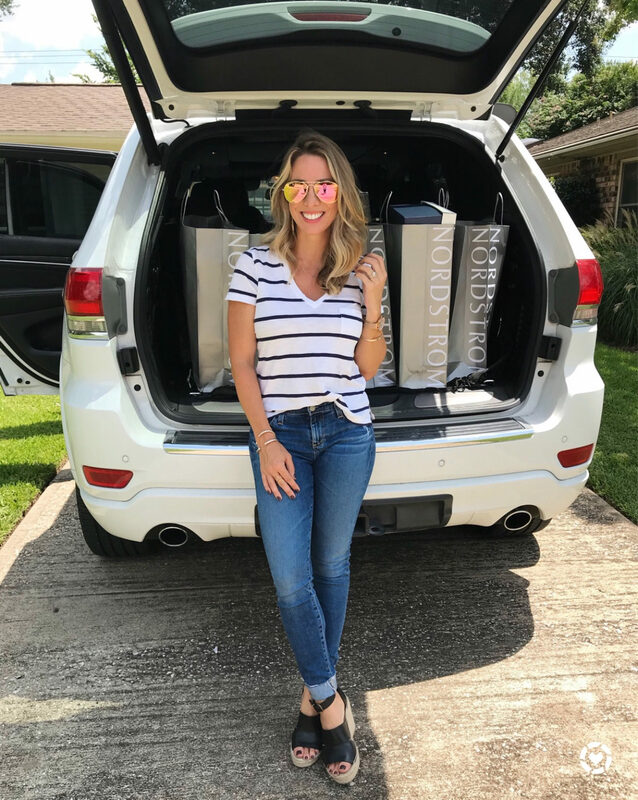 My picks: Back to school must-haves – uniform pieces, school shoes, and backpacks! 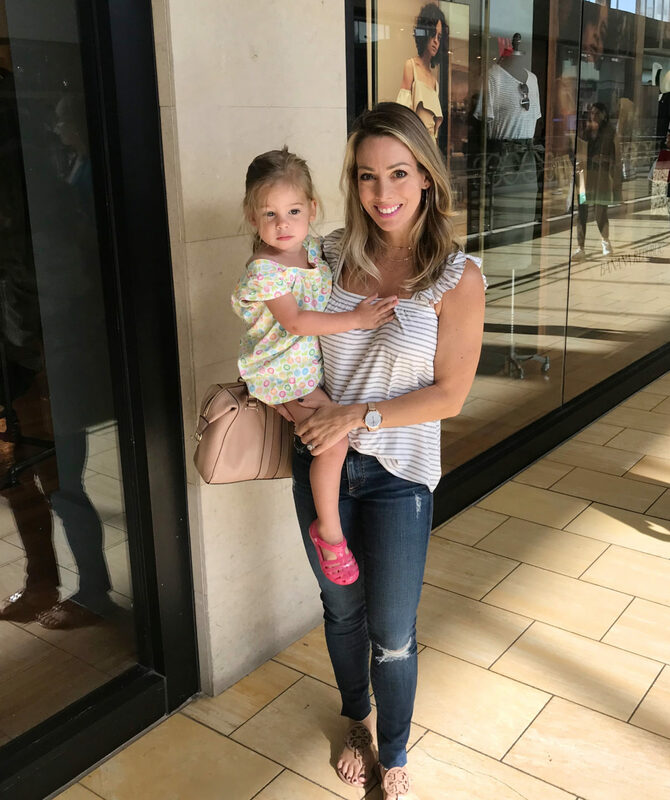 My picks: Some of the cutest fall basics for the kiddos and a good sale on denim! 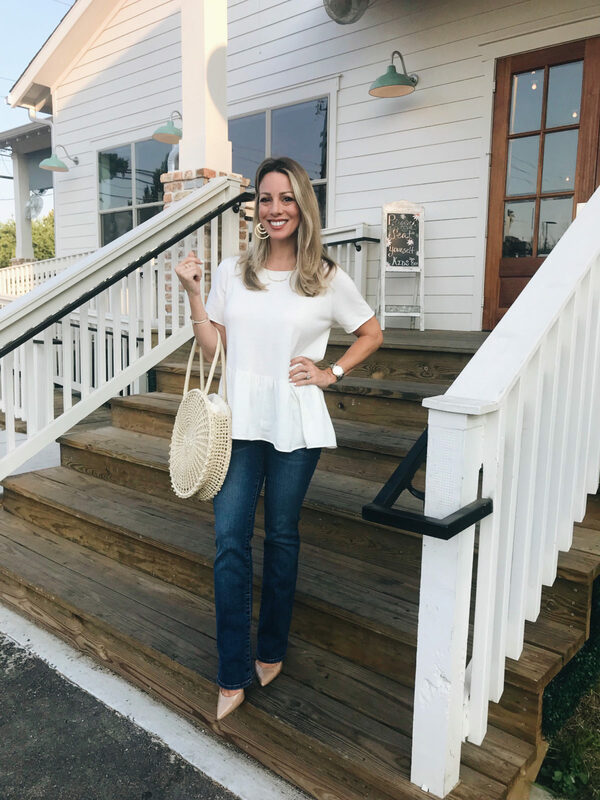 My picks: Loving this relaxed utility shirt and this peplum chambray. Would love to hear about some of your lunch ideas for James! My son starts kindergarten in a couple of weeks and he wants to take his lunch. I’d love to be able to meal prep the Sunday before and have his meals ready to throw into his lunch box the night before school. James is so happy eating the same things on repeat so that’s what we do. I’ve seen so many creative ideas on Pinterest, but my son would refuse anything but his usual. I totally get the summer struggle. 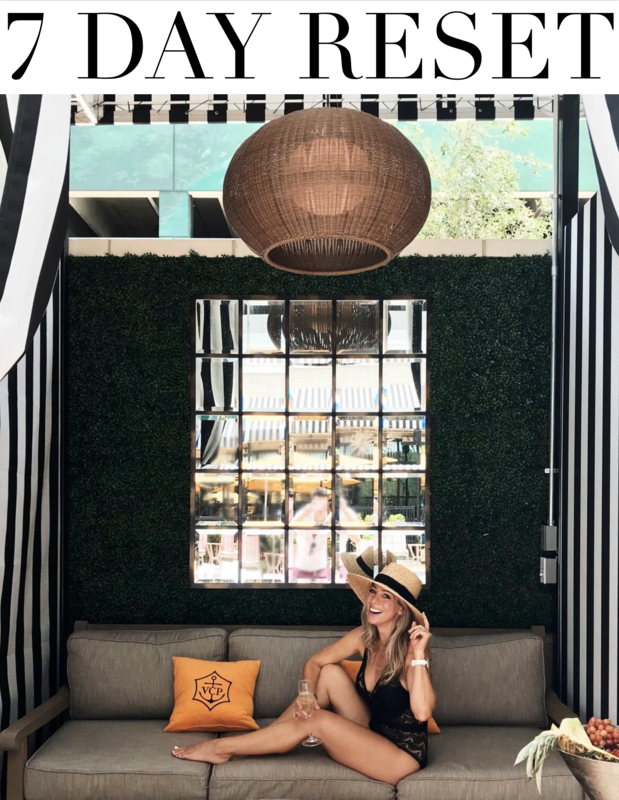 While I love the weather, beach/pool days, many joys of summer since I live in Boston and winters are long, I love a good schedule and I feel like in the summer we are never on one! Between camps, vacations etc. I work full time outside of my house so I always have mom guilt! But I have learned to be able to do what I can that make me and my family happy! My mom is so helpful and is at home after school daily so I can be in the office! Happy First Day of School! We don’t go back until after Labor Day. That’s sounds like a really healthy perspective. I try to set and stick to ‘work hours’ but it’s hard with so many demands on our time. I feel like our school year starts so early! Love, love, love red jumpsuit on you. Not everyone can pull up jumpsuit but you look stunning.